WITH the increase in meal choice available from the explosion of food delivery services you might be surprised who now rules the roost when it comes to take-away food, according new research. More than 17 million Australians aged 14+ (84.5 per cent) buy or eat take away food, whether from leading fast food outlets such as McDonald’s, KFC or Subway or from the local fish and chips shop, pizza shop, convenience store or the like, the Roy Morgan figures show. Roy Morgan CEO Michele Levine says the research shows meal delivery services have barely impacted on Australians love of traditional fast food outlets such as McDonald’s, KFC, Subway and Hungry Jack’s. “Over half of Australians aged 14+ (52.7 per cent) eat McDonald’s in an average six months while traditional fast food rival KFC is second on 40.8 per cent,” she said. “Nearly a third of Australians eat Subway, Hungry Jack’s or Domino’s Pizza food in an average six months and Domino’s Pizza is now the third most popular restaurant for the upcoming Generation Z.
Analysing the leading quick service restaurants by generation shows that McDonald’s and KFC are the two top quick service restaurants for all five generations. McDonald’s is much preferred to KFC across the generations. 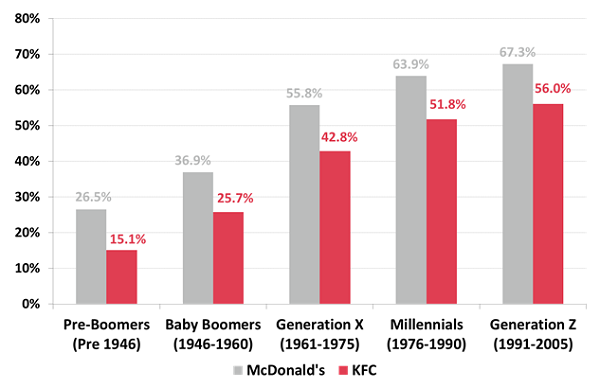 Patronage of leading quick service restaurants is heavily correlated to age with Generation Z the most likely to eat at McDonald’s (67.3 per cent) and KFC (56 per cent) while Pre-Boomers are the least likely of the generations to eat at either. Only 26.5 per cent of Pre-Boomers eat at McDonald’s and only 15.1 per cent eat at KFC. Subway is the third most popular quick service restaurant for Pre-Boomers (14.8 per cent), Baby Boomers (21.3 per cent) and Generation X (32.7per cent). 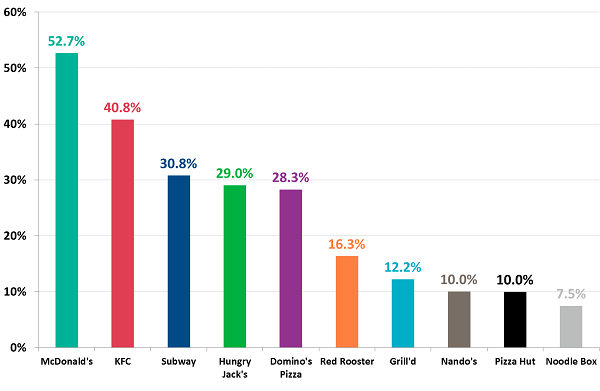 Hungry Jack’s comes in third for Generation Y on 36.9 per cent and Domino’s Pizza is third for Generation Z, on 42.2 per cent.